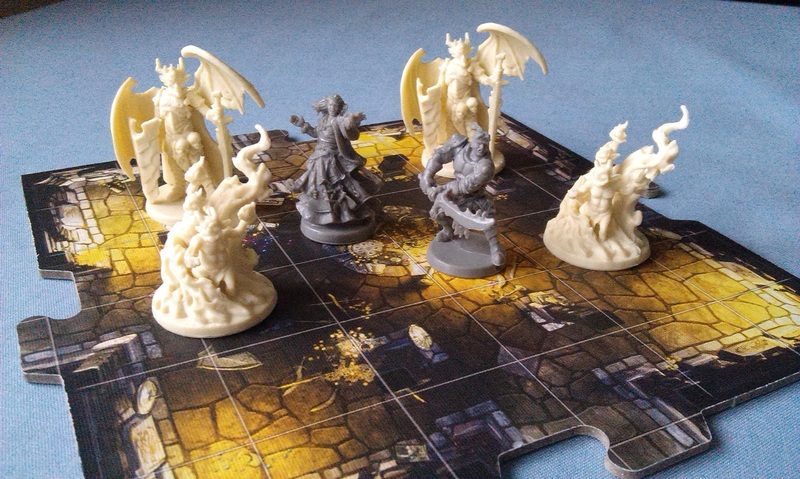 It’s game day here at spalanz.com, and today I thought it’d be cool to take a look at some expansions for Descent 2nd Edition, a game that I first featured on the blog here back in 2015: let’s look at the Lair of the Wyrm! The treacherous Wyrm Queen Valyndra has awoken from her slumber, unleashing her foul hybrid minions on the countryside to burn and raid as they please. Her lust for gold has lured her from her lair, and now it’s up to a few brave heroes to drive her back into hiding and destroy her cruel servants! 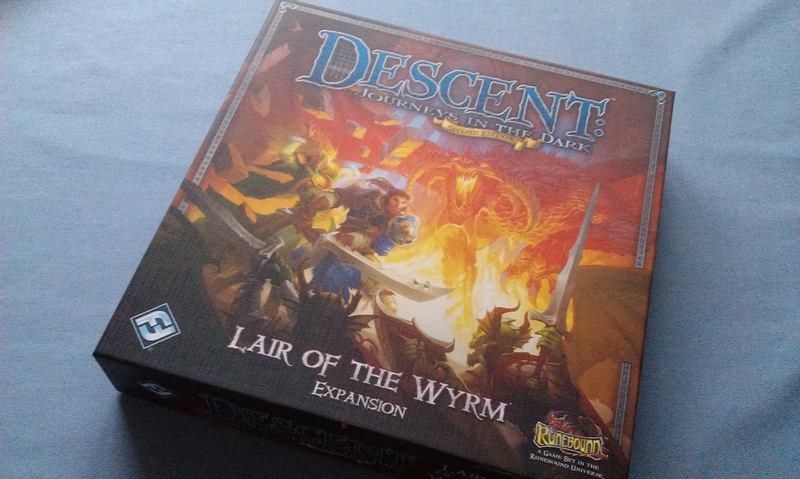 The first expansion for Descent, Lair of the Wyrm came out in 2012, and is what I suppose you could now call a small box expansion for the main game. As such, it comes with more of everything, which is never a bad thing as far as I’m concerned! We get new items, new enemies, and new heroes, as well as new tiles and five new quests that link into a new campaign to go on as we delve into the lair of Valyndra, the wyrm of the title. First of all, let’s look at the heroes. 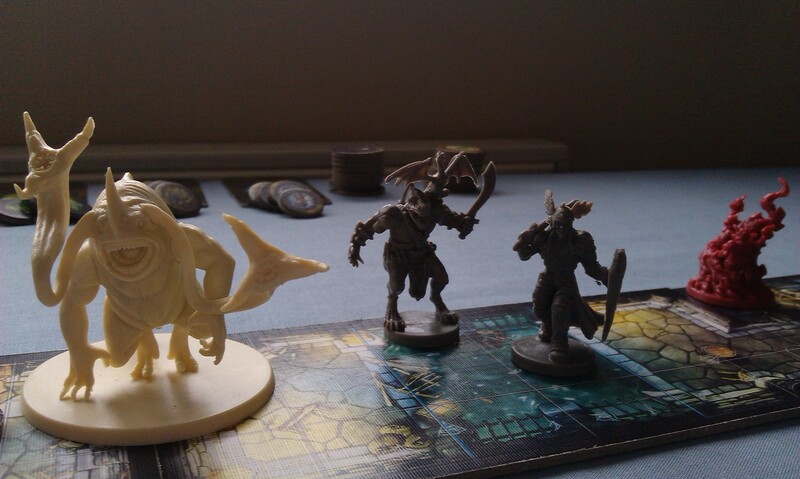 We get two: Reynhart the Worthy, and High Mage Quellen. Reynhart is from the warrior archetype, and comes with a new Champion class, while the mage Quellen brings the new Geomancer class with him. Both of these allow for more options for all manner of heroes, of course, which is something that I always enjoy seeing. Again, the item cards provide more of the same, though a new aspect of the game is introduced through something called Secret Rooms, which allow you to place a whole new tile that can be searched, in a mechanic that feels very similar to the secret door cards in DungeonQuest. Unlike in that game, you don’t start a whole new area of the map, but rather continue on with the current quest once the Room has been resolved, but it just feels very similar, and I thought I’d mention it! Valyndra herself is a Lieutenant for the Overlord, and as such is sold separately as a miniature, though there is a large cardboard tile the size of her base to represent her in the game if you don’t want to add the mini. She’s pretty huge, and very detailed, and I can’t imagine anyone who wouldn’t want to have this model on the tabletop as a final boss monster. Valyndra comes with all the usual lieutenant pack stuff, and the Overlord in general gets some nice new toys in this box, including the new Punisher class that can be pretty brutal on the heroes. 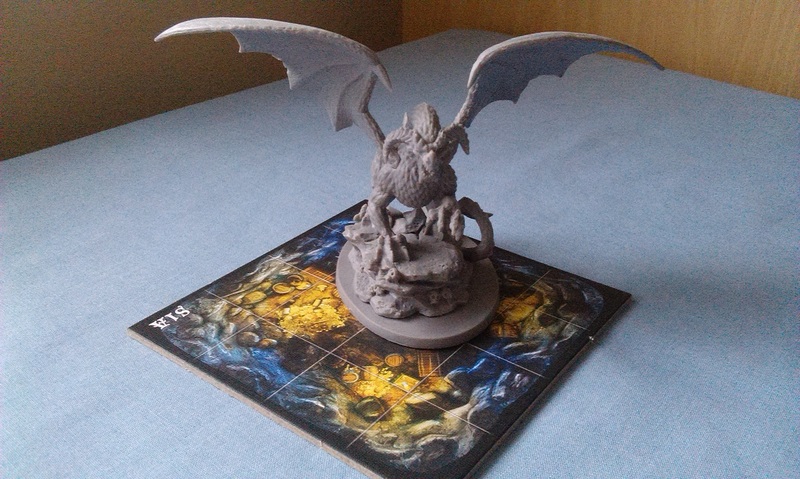 Lair of the Wyrm is also used in the co-op scenario Dark Elements, which successfully blends the base game with the expansion in a new and exciting way. The co-op scenario plays a little like Shadows of Brimstone, if you’re familiar with that game, whereby the heroes are progressing through the quest in the light of a single torch that illuminates only a few squares around them. The elements involved in this quest include both enemy units from Lair of the Wyrm, along with the Elementals from the base game and – my favourite enemy type so far in the game – merriods! If you’re looking for a great co-op expansion for Descent, and want to use the bits from Lair of the Wyrm, then this is definitely it! Lair of the Wyrm is an incredibly flavourful expansion to the Descent line, and definitely worth picking up if you find yourself in need of some dragon goodness for your games (and let’s be honest, who wouldn’t want dragon goodness in their games?) As of the time I’m writing this, I believe it’s getting quite difficult to find, being one of the earlier expansions for the game, but definitely worthwhile picking up if you can! Previous Previous post: Red-and-black for Standard! Next Next post: The Overlords are coming!